Eritrean youth and its national obligation. ኣብዚ ላዕለዋይ ኣርእስቲ ክዛተ ዝቐርብ ዕዱም ጋሻና፡ ኣቶ ፍጹም ኣይጽገብ ኢዩ። ክትሳተፉ ብኽብሪ ትዕደሙ። Our invited panellist discussing the topic above are: Mr Fitsum Aytsigeb. You are all cordially invited to participate. ኣብዚ ላዕለዋይ ኣርእስቲ ክዛተ ዝቐርብ ዕዱም ጋሻና፡ ዶ/ር ኪዳነ መንግስትኣብ ኢዩ። ክትሳተፉ ብኽብሪ ትዕደሙ። Our invited panellist discussing the topic above are: Dr. Kidane Mengisteab. You are all cordially invited to participate. Current Demands of the Eritrean People. ፍትሓዊ ሕብረተሰብ፡ እንታይ ማለት ኢዩ? ኣብዚ ላዕለዋይ ኣርእስቲ ክዛተዩ ዝቐርቡ ዕዱማት ኣጋይሽና፡ ኣቶ ኪዳነ ሓጎስን፡ ኣቶ ክብርኣብ ተስፉን ኢዮም። ዝለዓሉ ኣርእስቲታት፡- (1)ቦታን ባይታን ዜግነት (2)ትርጉም ዜግነት (3)ሲቪል ሶሳይቲ (4)መበቆል ዜግነት (5)ሰብኣዊ መሰል (6)ናጻ ህዝቢ ኤርትራ እንታይ ማለት'ዩ? (7)ወዳቢ መትከልና ሲቪካዊ ሃገርነት'ዩ (8)እቲ መድሕን ትካላዊ ኣከያይዳ ጥራሕ'ዩ (9)ጉጅላዊ ኣነጻጻግን ሳዕቤናቱን (10)ኤርትራን ብተሰራረዝቲ ሓይልታት ዝጨቅውወ ታሪኻን፡ ዝብል’ዩ። ክትሳተፉ ብኽብሪ ትዕደሙ። Our invited panellist discussing the topic above are: Mr Kidane Hagos and Mr Kibreab Tesfu. The points to raise include:(1)Lotus and Focus of citizenship (2)The meaning of citizenship (3)What doescivic society mean? (4)Human Rights in Eritrean case (5)What does free society mean? (6)Our organizing principle is "Civic Nationalism" (7)Sectarianism and its consequences. You are all cordially invited to participate. What does Just Society mean? ኣብዚ ላዕለዋይ ኣርእስቲ ክዛተዩ ዝቐርቡ ዕዱማት ኣጋይሽና፡ ኣቶ ኪዳነ ሓጎስን፡ ኣቶ ክብርኣብ ተስፉን ኢዮም።። ክትሳተፉ ብኽብሪ ትዕደሙ። Our invited panellist discussing the topic above are: Mr Kidane Hagos and Mr Kibreab Tesfu. You are all cordially invited to participate. Towards Durable Peace & Justice in Eritrea. Challenging Ethiopia - Eritrean Myth. ኣብዚ ዘተዚ ዝለዓሉ ኣርእስትታት፡- (1) ተደምረናል (2) ፈደረሽን - ኮንፈደረሽን (3) ባህላዊን ታሪኻዊን ዝምድና ኢትዮ-ኤርትራ (4) ሃገር እንታይ ማለት ድዩ? (5) ብዋጋ ናጽነትና'ዶ ሰላም ኣሎ ኢዩ? ዝብሉ ክኾኑ ኢዮም። ኣብዚ ላዕለዋይ ኣርእስቲ ክዛተዩ ዝቐርቡ ዕዱማት ኣጋይሽና፡ ኣቶ ኪዳነ ሓጎስን፡ ኣቶ ክብርኣብ ተስፉን ኢዮም።። ክትሳተፉ ብኽብሪ ትዕደሙ። Our invited panellist discussing the topic above are: Mr Kidane Hagos and Mr Kibreab Tesfu. You are all cordially invited to participate. ጉዳይ ምኽፋትን ምዕጻውን ዶባት፡ ኣብ ዝምድና ኢትዮጵያን ኤርትራን እንታይ ማለት ኢዩ? What does the openning and closing of borders mean for Eritrea? ሰፊሕ ህዝባዊ ምንቅስቓስ ኣድላይነቱን ኣገባቡን፡ Peoples movement: its importance and means of interpretation. ብሓባራዊ ድሌት ዝተደረኸ ሓባራዊ ኣረዳድኣ፡ Understanding Driven by Common Interest. ኣብ ህሉው ፖለቲካዊ ኩነታት ኤርትራ፡ On Current Eritrea Political Situation. ኣብ ናይ ሎሚ መደብና፡ ኣብ ህሉው ፖለቲካዊ ኩነታት ኤርትራ ኮይኑ፡ ሓው ጀማል ሑመድ ካብ ኣውስትራልያ፡ ምስ ሓጅ ዓብደልኑር ዝተኻየደ ቃለመጠይቕ ኢዩ። ብጽሞና ክትከታተሉዎ ንዕድም። Mr. Jemal Humed interviews Haaj Abdulnoor, from Australia. All are cordially invited to listen. ኣብዚ ኣገዳሲ ዘተ’ዚ፡ ዝተሳተፉ ዕዱማት ኣጋይሽ፡ ኣቶ ኪዳነ ሓጎስን ኣቶ ክብርኣብ ተስፉን ኢዮም። ክትሳተፉ ብኽብሪ ትዕደሙ። The panellists are Mr Kidane Hagos and Mr Kibreab Tesfu. All are cordially invited to participate. ጉጅላውነትን ሕቶ ውክልናን ኣብ ፖለቲካ ኤርትራ፡ Sectarianism and the question of representation in the Eritrean Politics. “ፖለቲካዊን ቁጠባዊን ውህደትን” ዕንደራ ኢሳይያስን፡ “Political and economic union” and adventure of Isaias Afewerki. ዕዱማት ኣጋይሽ፡- ኪዳነ ሓጎስን ክብርኣብ ተስፉን። ክትሳተፉ ብኽብሪ ትዕደሙ። Our invited guests are: Mr Kidane Hagos and Mr Kibreab Tesfu. All are cordially invited to participate. 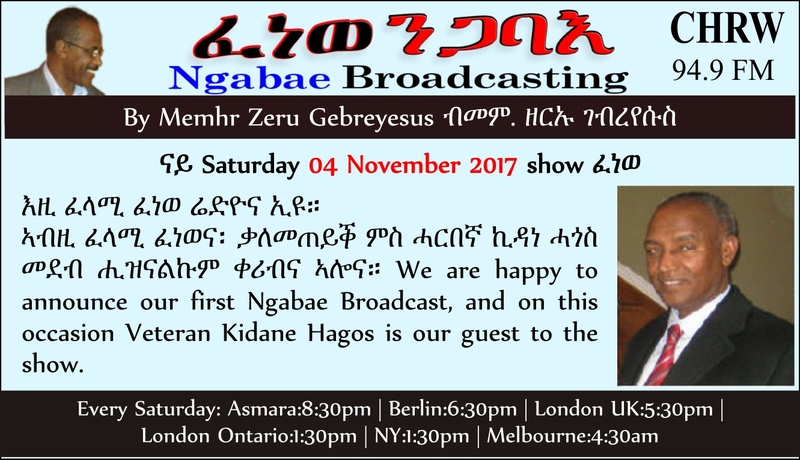 ኤርትራዊ ሃገራዊ ሓይሊ፡ ታሪኹ፡ ኣተሃላልዋኡን መጻኢኡን። Eritrean national force: its history, its present condition and it's future. ኣብዚ ኣገዳሲ ዘተ’ዚ፡ ዝተሳተፍ ዕዱም ጋሻና፡ ኣቶ ጎይትኦም ኢማም ኢዩ። Our invited Guest is Mr Goitom Emam. ኣብዚ ኣገዳሲ ዘተ’ዚ፡ ዝተሳተፉ ዕዱማት ኣጋይሽ፡ ኣቶ ኪዳነ ሓጎስን ኣቶ ክብርኣብ ተስፉን ኢዮም። The panellists are Mr Kidane Hagos and Mr Kibreab Tesfu. ኤርትራዊ ሃገርነትን ኤርትራዊ መንነትን፡ ሃገራዊ ዜግነት እንታይ ማለት’ዩ? Eritrean Nationhood & Eritrean Identity & What is Citizenship? ኣብዚ ኣርእስቲ’ዚ ንዘተ ዝቐረቡ ዕዱማት ኣጋይሽ፡ ኣቶ ኣቡበከር ዓሊን ዶር ኪዳነ መንግስትኣብን ኢዮም። Our invited guests discussing on the topic above are Mr Abubakar Ali and Dr Kidane Mengisteab. ኣብዚ ኣገዳሲ ዘተ’ዚ፡ ዝተሳተፉ፡- ኣቶ ክብርኣብ ተስፉ፡ ኣቶ ኪዳነ ሓጎስን ኣቶ ኣቡበከር ዓሊ ዑስማንን ኢዮም። ክትሳተፉ ብክብሪ ትዕደሙ። This panellists on this important topic were Mr Kibreab Tesfu, Mr Abubeker Ali Osman and Mr Kidane Hagos. All are cordially invited to join. ኤርትራዊ ሃገርነትን ኤርትራዊ መንነትን፡ Eritrean Nationhood & Eritrean Identity. ኣብዚ ኣርእስቲ’ዚ ንዘተ ዝቐረቡ ዕዱማት ኣጋይሽ፡ ኣቶ ኪዳነ ሓጎስን ኣቶ ክብርኣብ ተስፉን ኢዮም። Our invited guests discussing on the topic above are Mr Kidane Hagos and Mr Kibreab Tesfu. ህንጸት ሃገር፡ ትርጉሙ፡ መዓስን ብኸመይን Nation-building - What it is? When and How? The Meaning of Change in Our Situation. ትርጉም ለውጢ ኣብ ህልዊ ኩነታትና፡ መኣስን ብኸመይን? ብዚ ኣርእስቲ'ዚ ምስ ሰማዕቲ ዝዝቲ ዕዱም ጋሻና፡ ኣቶ ኪዳነ ሓጎስ ኢዩ። Our invited guest discussing on the above topic is Mr Kidane Hagos. ኣጋይሽና፡ ኣቶ ኪዳነ ሓጎስ፡ ኣቶ ክብርኣብ ተስፉን ኢዮም። Our invited guests are Mr Kidane Hagos and Mr Kibreab Tesfu. All are cordially invited to join. ኣጋይሽና፡ ኣቶ ኪዳነ ሓጎስ፡ ኣቶ ክብርኣብ ተስፉን ኢዮም። Our invited guests are Mr Kidane Hagos and Mr Kibreab Tesfu. ቃልሲ ንጋባእ፡ ኣብዚ ህሉዊ ኩነታት ሃገርናን መስርሕ ሓድነት ህዝብናን፡ Ngabae on the process of our unity and the Current stage of Eritrea. ኣጋይሽና፡ ኣቶ ኪዳነ ሓጎስ፡ ኣቶ ክብርኣብ ተስፉን ኣቶ ያዕቆብ እድሪስን ኢዮም። Our invited guests are Mr Kidane Hagos, Mr Kibreab Tesfu and Mr Yacob Idris. ዓበይቲ ኣጀንዳታት፡ ህሉው ኩነታት ሃገርና። BIG Agenda--Current Situation of Eritrea ናይ ሎሚ ቀዳም 28 2018 ኣጋይሽና፡ ኣቶ ኪዳነ ሓጎስ፡ ኣቶ ክብርኣብ ተስፉን ኣቶ ዓብዱረዛቕ ሙሳን ክኾኑ ኢዮም። ክትሳተፉ ብኽብሪ ትዕደሙ። Our pannelists are: Mr Kidane Hagos, Mr Kibreab Tesfu and Mr Abdurezak Mussa. All are cordially invited!. ብድሆታት ሰላምን ምርግጋእን ኣብ ቀርኒ ኣፍሪቃ። The Challenges of Peace and Stability in the Horn of Africa. ምስዚ ዝኸይድ ዘሎ ርክባት ኢትዮጵያን ኤርትራን፡ ብወገን ኤርትራዊ ምንቅስቓሳት ንለውጢ ዝውሰዱ ዘለዉ ተበግሶታት። Ethiopia-Eritrea Relations and initiatives being taken by Eritrean Grassroots justice-movements. ኣብዚ ኣርእስቲዚ ዝዝትዩ ኣጋይሽና ኣባላት ህዝባዊ ምልዕዓል ኮይኖም (1) ኣቶ ጸጋይ ነጋሽ (2) ኣቶ መኮነን ኣብራሃም ኢዮም። ሰናይ ምክትታል። Our invited guests are Mr Tzegai Negash and Mr Mekonen Abraham. All are cordially invited to join on the show. ናይ ሎሚ ዕዱማት ኣጋይሽና፡ ኣቶ ኪዳነ ሓጎስን ኣቶ ክብርኣብ ተስፉን። With Mr Kidane Hagos and Mr Kibreab Tesfu ኢዮም። መዛተዪ ኣርእስቲ ድማ (TOPIC)፡- ጉዳይ ኤርትራን ኢትዮጵያን ብዓይኒ ንጋባእ (P2)። Ngabae's outlook on Eritrea-Ethiopia Relations (P2). ናይ ሎሚ ዕዱማት ኣጋይሽና፡ ኣቶ ኪዳነ ሓጎስን ኣቶ ክብርኣብ ተስፉን። With Mr Kidane Hagos and Mr Kibreab Tesfu ኢዮም። መዛተዪ ኣርእስቲ ድማ (TOPIC)፡- ጉዳይ ኤርትራን ኢትዮጵያን ብዓይኒ ንጋባእ። Ngabae's outlook on Eritrea-Ethiopia Relations. ናይ ሎሚ ዕዱማት ኣጋይሽና፡ members of the Festival Atlanta 2018 Organizing Committee - Mr Jemal Mohammed & Mr. Isaias Seyoum ኢዮም። ሎሚ ቀዳም፡ ዕላልና ምስ ኣብ ኣትላንታ ኣመሪካ ፈስቲቫል ኤርትራውያን (ካብ ዕለት 3 - 5 ነሓሰ 2018)ንምክያድ እተዳሉ ዘላ ኮሚቴ፡ ምስ ሓው ጀማል መሓመድን ምስ ሓው ኢሳይያስ ስዩምን፡ ዝተኻየደ ዕላል ኢዩ። Our invited guests this Saturday are members of the Festival Atlanta 2018 organizing committee, Mr Jemal Mohammed & Mr. Isaias Seyoum. ትርጉም ናጽነት፡ ገምጋምን ዝሓለፈ 27 ዓመታትን። Eritrean Independence, Reflections and outcome over the last 27 Independence years. ናይ ሎሚ ዕዱም ጋሻና፡ ሓው ዓብዱረዛቕ መሓመድ ሙሳ ካብ ሃገረ-ሆላንድ ኢዩ። መዛተዪ ኣርእስቲ ድማ፡- ጻውዒት ምእንቲ ኣድማዒ ቃልሲ ህዝቢ ኤርትራ ዝብል ክኸውን ኢዩ። Our guest is Mr Abdurezak Mohammed Mussa, from Holland. Our Topic is: A call for decisive popular movement for Justice. ተራ መንእሰያት ኣብ ዝሓለፈ ሃገራዊ ሓርነታዊ ቃልሲን ኣብዚ ሕጂ ንፍትሒ ዝክየድ ዘሎ ቃልሲን። Role of youth during Eritrean liberation struggle and on the ongoing Justice movement. Role of youth during Eritrean liberation struggle and on the ongoing Justice movement. PFGJ Linguistics and its negative Social-engineering impacts on our society. ኣብዚ ኣቶ ኪዳነ ሓጎስን ወ/ሮ ሓረጉወይኒ ኣሰፋ ስለኣምሳ፡ ዝተኻየደ ናይ 10ይ ክፋል ዝተላዕለ ዛዕባ፡- ቃልሲ ኤርትራውያን ደቀንስትዮ፡ ምዕባለታቱን ውጽኢቱን፡ ዝብል ኢዩ። Guestz: Mr Kidane Hagos & Mrs Hareguweini Asefa Sileamsa and the topic was focussed on Eritrean Women’ struggle and movement and its achievements. ዕላል ምስ Discussion with:- ኣባላት ‘መርበብ ኤርትራውያን ደቀንስትዮ’ Members of ‘Network of Eritrean Women’ ቀዳም፡ ዕለት 24 February 2018፡ ምስ ኣባላት ‘መርበብ ኤርትራውያን ደቀንስትዮ’ (1) ዶ/ር ሳራ ዑቕባይ፡ (2) ወ/ሮ ከዲጃ ዓሊ መሓመድ ኑር፡ ብዛዕባ ዕላማታት ማሕበረንን ካልእ ንሃገርና ዝትንክፍ ጉዳያትን ዝምልከት ፍሉይ መደብ ሒዝናልኩም ክንቀርብ ኢና። This Saturday our guest are Dr. Sarah Ogbai and Mrs Kadijah Ali Mohamed Nur, from ‘Network of Eritrean Women’. Discussion will focus of their organisation’s activities and other issues affecting Eritrea and Eritreans. Panel discussion with Mr Kibreab Tesfu and Mr Kidane Hagos. ህዝባዊ ምልዕዓላትን ለውጥታትን ከባቢና፡ ካብዚ እንታይ ንመሃር? ብኸመይ ይጸልወና? እንታይ ክንገብር‘ከ ይግባእ? Popular movements in our region, What to learn from them? How they influence us? What is to be done? ኣብ ህሉው ኩነታት ከባቢናን ምትእትታው ግዳማዊ ሓይልታትን። On Current Eritrean and Regional issues. Panel discussion with Veteran Kibreab Tesfu and Veteran Kidane Hagos. ብዛዕባ ህሉው ኩነታት ሃገርናን ህዝብናን፡ መፍትሒኡን። About Current Eritrea Political issues and Solutions. ዕላል ምስ ሓርበኛ ኤልሳ መስፍን፡ Interview with Veteran Elsa Mesfin. ሓርበኛ ኤልሳ መስፍን፡ ገዲም ተጋዳሊት ተሓኤ፡ ብደረጃ መሪሕነት ኣብ ሃገራዊ ማሕበር ደቀንስትዮ (ተሓኤ) ዘገልገለት ምኩርቲ ሓርበኛ ኢያ። ተመኩሮኣን ገምጋማን፡ ብዛዕባ ቃልሲ ደቀንስቶዮ ኣብ እዋን ብረታዊ ቃልሲን ድሕሪ ናጽነትን፡ ተካፍል። Elsa Mesfin, is an Eritrean woman veteran (ELF) who served as member of the Eritrean Women's Association Leadership. She shares her experience and assessment of Eritrean women's struggle before and after Eritrea's Independence. 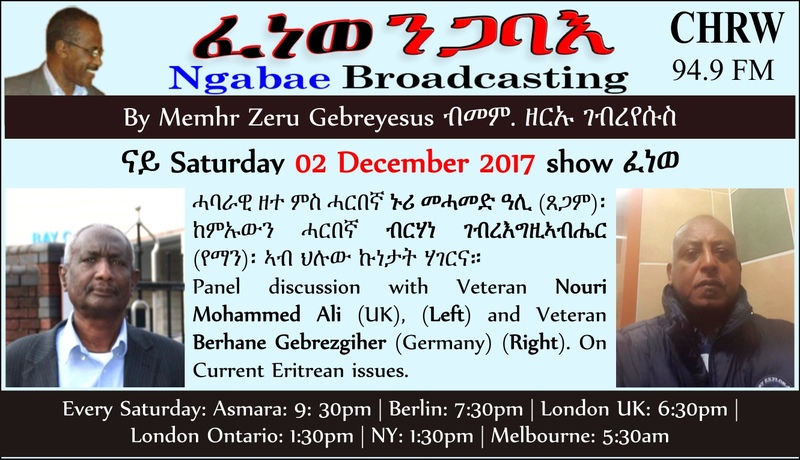 Current Geopolitical developments in our region and its implications..
ኣብ ህሉው ኩነታት ሃገርና። On Current Eritrean issues. ቃለመሕትት ምስ ኣምባሳዶር ዓንደብርሃን ወልደጊዮርጊስ። Interview with Ambassador Andebrhan Woldeghiorgis. Amba. 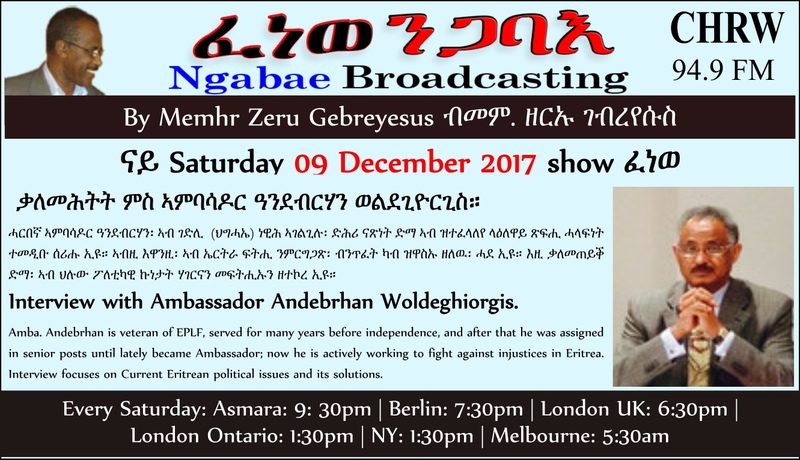 Andebrhan is veteran of EPLF, served for many years before independence, and after that he was assigned in senior posts until lately became Ambassador; now he is actively working to fight against injustices in Eritrea. Interview focuses on Current Eritrean political issues and its solutions. 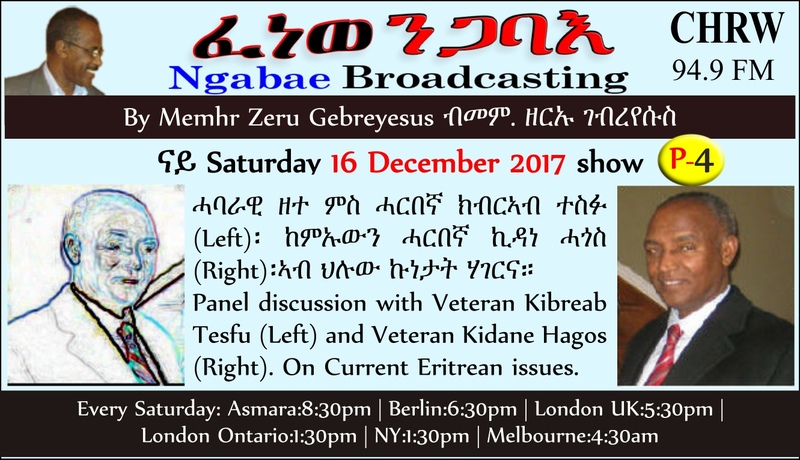 Panel discussion with Veteran Kibreab Tesfu and Veteran Kidane Hagos ኣብ ህሉው ኩነታት ሃገርና። On Current Eritrean issues. እዚ ፈላሚ ፈነወ ሬድዮና ኢዩ። ኣብዚ ፈላሚ ፈነወና፡ ቃለመጠይቕ ምስ ሓርበኛ ኪዳነ ሓጎስ መደብ ሒዝናልኩም ቀሪብና ኣሎና። We are happy to announce our first Ngabae Broadcast, and on this occasion Veteran Kidane Hagos is our guest to the show.